After many months of hard work, this book is just weeks away from publication. The cover design is done. The book is going through another edit, and the index is in the process of being constructed. After the final edit, the page number can be added to the table of contents as well as the index. Many people dream of writing their own book, writing and producing a song, or making their own movie. People have since these forms of media were dicovered. The Twenty First Century has brought this ability within reach of the common person. Even so, commercial software that is used to produce and publish media can be very expensive running into the thousands. Many people just starting out or who have to support their families may not have or do not want to spend thousands on realizing their dream. 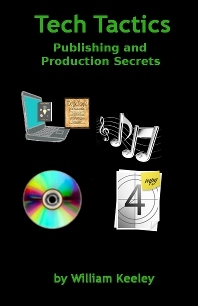 "Tech Tactics Publishing and Production Secrets&quoe; can help the aspiring producer or publisher cut down significantly on these expenditures. Video cameras and audio equipment may still have to be purchased, but just about all the necessary software can be found for free. Although programs like Photoshop, Final Cut Pro, Microsoft Office as well as some others are industry standard, other free, open source programs can do the same job. The interfaces may be different, or the free software migh not have a certain feature, one can bet that another free program will have the feature that is needed. In some cases, the free, open source program may actually perform better than the commercial programs, or they may have features not available on the commercial software. This book discusses many of the free programs as well as where they can be obtained. Not only does this book discuss free software, but it also discusses some of the industry standard codes and numbers that are required to sell media products in most stores. This book not only discusses what numbers are needed, but it also tells the reader where these numbers can be obtained. Some of these numbers can be obtained for free, or they can be obtained at a significant reduction in cost. Many people who want to write a book, produce a movie, or produce music dream also of being rich and famous. Unfortunately, only a very, very small precentage of aspiring writers, movie makers, or musicians actually get to be rich or famous. While one may not get to be rich or famous, there is still money to be made in the business. Other people may not expect fame and fortune, but they still want to make a song, write a book, or produce video. Now it is easy to do so at minimal cost. They may just want to tell their story, create a wedding video, make a love song for their significant other, or make instructional media. Others may just want to put their pictures, music, or home video onto a CD or DVD. For all of these things, this book is helpful. Like my other book, if someone uses a program that they learned about in this book instead of buying a commercial application, then this book has more than paid for itself. This book will help save someone who knows very little about publishing and production from getting ripped off or spending many frustrating hours searching the Internet and wading through sites that aim to sell products and services.